Bodu Bala Sena (BBS) General Secretary Ven. Galagoda Atte Gnanasara Thera was absent in Court today for the hearing of the alleged offensive behaviour inside the Homagama Magistrate’s Court case, citing that he has received death threats. The Court of Appeal observed that Court will have to issue warrant against the accused if he failed to appear in Court on next inquiry date. President's Counsel Tirantha Walaliyadda with Counsel Sasika Mithunaarachchi appearing on behalf of Gnanasara Thera told Court that their client was not appearing in Courts since he has gotten death threats. However, at a previous occasion, counsel who appeared on behalf of Gnanasara Thera tendered a medical certificate to Court informing that Gnanasara Thera was being treated at a hospital for an illness. Senior Deputy Solicitor General Rohantha Abeysuriya appearing for the Attorney General moved Court to issue a warrant for the arrest of accused for not appearing in Court on several occasions citing various reasons. The Court of Appeal Justice L.T.B. Dehideniya and Justice Devika Tennakoon observed that they would not issue a warrant against accused but Court wanted the accused to be present in Court on July 18, 19 and 20. Former Homagama Magistrate Ranga Dissanayake referred this Contempt of Court action to the Court of Appeal since it is vested with powers to inquire such a complaint. At a previous occasion, the Attorney General filed the amended charge sheet comprising four counts alleging that the accused had committed a punishable offence which comes under Article 105 of the constitution. At a previous occasion, a charge sheet signed by Court of Appeal’s President Judge had been served on the accused. In a surprising turn of events, on January 25, Ven. Galagoda Atte Gnanasara Thera began to address Open Court after the court hearing pertaining to the disappearance of journalist Prageeth Ekneligoda was over. Later on, Gnanasara Thera was arrested by police on the charges of contempt of courts, obstructing Court proceedings and intimidating a public servant. Through this contempt of Court action, the Homagama Magistrate has sought Appeal Court’s Jurisdiction to consider whether the alleged offensive behaviour and utterance of Gnanasara Thera inside the Court amounts to Contempt of Court. He further sought Court’s jurisdiction to take necessary legal action against Gnanasara Thera if the charges levelled against him amounts to Contempt of Court. This is becoming farcical. 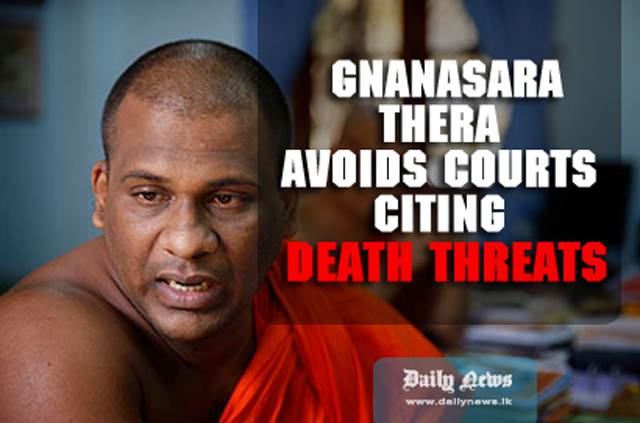 It's odds on Gnanasara Thera will not come to court on July 18, 19 and 20 because if the alleged death threat is a valid reason today, it will also be valid in July. He is being treated with kid gloves just because he is a monk. He is no more a monk with his atrocious behaviour than I am. Charge this hooligan for contempt of court. It is astonishing that such a hoodlum should be scared to death threats.